Google Author Rank: It’s been a long time since the last article, but a Blog can not be neglected, so we at Marconi Media decided to cover a very interesting subject, that of an imminent new type of Rank, possibly a game changer, because of it’s importance in the positioning of your website in the Google Searches. Google Author Rank is something with an interesting sound to it, it almost sounds like Larry Page’s Page Rank might get a smaller (bigger?) brother. So what is Author Rank? Basically, it is just what it means: a rank generated by the many signals or rather feedback that an author’s articles and posts get. Now, this might sound like it has nothing to do with a website’s ranking, but it does actually mean that a website with a higher PageRank and lower Author Rank could rank lower in the search results, than a lower Page Rank site that belongs to an author with a high Author Rank. It all comes down to which author is more trustworhty. So, you might ask, how does this influence Google Intent? Because obviously, if we are talking about a search phrase like “Apple Ipad 2″, Google has to guess what the intention of the searcher is: to find out more about the new Ipad – in which case it should show the page that’s author has a higher Author Rank – or to buy an Apple Ipad 2, in which case it should show the most relevant store first. Anyway, answering this question is beside the scope of this article, I just thought that this question hasn’t been raised yet (or not that I know of). Google Author Rank is simply the quantification of all the feedback the author’s articles get. It is basically the same as PageRank, but relies much more on feedback rather than links. Thus, the Author Rank relies on Social Networking shares, number of feedback, posting frequency, PageRank of the sites that link to the article/post and of course Author Rank of the sites and their authors linking to the Article. Google does have a nack for considering their own products first, so Google+ activity and +1’s are obviously heavily relied on, but Facebook and Twitter activity is just as important, as well as direct comments done on the site itself. This does not mean that all business owners have to become authors or have to create their own blogs. But when we think about an IT/Gadget webshop and it’s product detail page versus a very detailed review written by a renowned author, obviously, the author’s page might rank higher, provided he has the same amount of information on the particular product with great added value consistign of tests, personal opinions, benchmarks, etc. 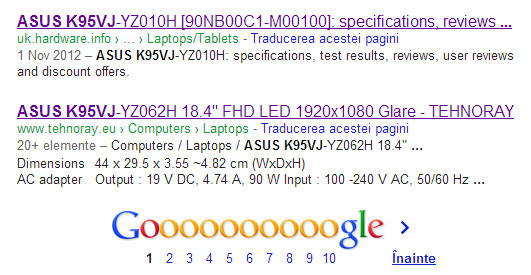 As you can see in the upper image, the first page of Google search results has both general information articles pages as well as webshops for the search “Asus K95VJ”. This tackles the question about Google Intent: Google doesn’t know what we were searching for if we haven’t added a word to hint to our intentions. Had we searched for “Asus k95VJ price”, surely the results would have been much more on the webshops’ side. This is why a search signal such as Author Rank could interfere with important sales determined by the positioning of product pages vs author-written product description and review pages. You can either add this link manually to your blog, website or wherever you might post your articles, or you can look for great plugins and widgets that do this for you atomatically, there are great plugins for WordPress for instance, that handle all these technicalities automatically, you just have to paste in your name, Google+ profile link and maybe upload an author photo. Google Author Rank vs/with Page Rank? Don’t look at the Author Rank as a game changer, which will ruin your link building efforts. Rather think about combining the two search engine signals. How would you go about doing that, you might ask? Simple: Create great content on your website, if you are not an author, and ask great authors to review your products/services. That is what I call great added value, and you will have both the greatest source of information about your product/service and the greatest, best-weighed comments/reviews, recognized by Google itself.